Brought mine year ago, have never had any problems. Sound great, about buy another pair as my grandkids keep pinching them. Mine are still working, and fit well sometimes slip down but you can adjust them. I havr brought expensive ones that didnt last long and sound wasnt good quality. Pretty cool and fits like a glove..no worries what so ever. Fantastic for a generic model. Sound is clear, not crisp, but it nice. The bass in the best, not too much. It feels comfortable, and its a great fit. Overall a nice package. Awesome. Easy to set up. Great sound. Comfortable fit, that can adjust to different lengths. Highly recommend. Don’t have to worry if lost or stolen at that price. No cords to get tangled up in, love wireless! 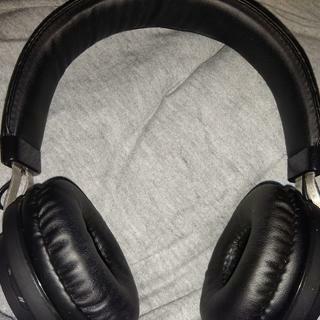 Good sound quality for the price for sure, a little tight on my head but after thinking about it I just flexed the headphones in a couple of places around the band to loosen them up! Would recommend to others. Only negative is if you have a couple of devices that you use the headphones on then it may connect to your laptop instead of your phone for example and the only solution I have found is to turn of bluetooth on the device you do not want to connect to and then turn them on to connect to the device you want to connect to. Other than that I have no complaints! Using as a wired 3.5mm headset, sounds are great. Try to connect to Windows 10 bluetooth, and it won't even show up as a pairable device, yet connects to my phone perfectly. Everything updated, but without a link to a munufacturers website, cannot see if it's a driver issue, and Google doesn't seem to recognise the brand. If you want bluetooth sound on your computer, go with a more reputable brand. I'm in love with these headphones! Great price, great size and great sound! Git theses for when I go time the gym and they are awesome to use compared to wired headphones. best ever !!!! full bass , noise block out , worth your money. I was pleasantly surprised at the sound quality and so were my friends.Really great value for money, and doesn't distort with increased volume. Easy connection. Sound quality of drivers is good but slight electrical sound present. Visible latency so not well suited for video. Fit is good for a smaller head - I got these for my 10yo son and they fit him comfortably (a little snug on me).